When can chocolate be enjoyed without guilty feelings about all its calories? 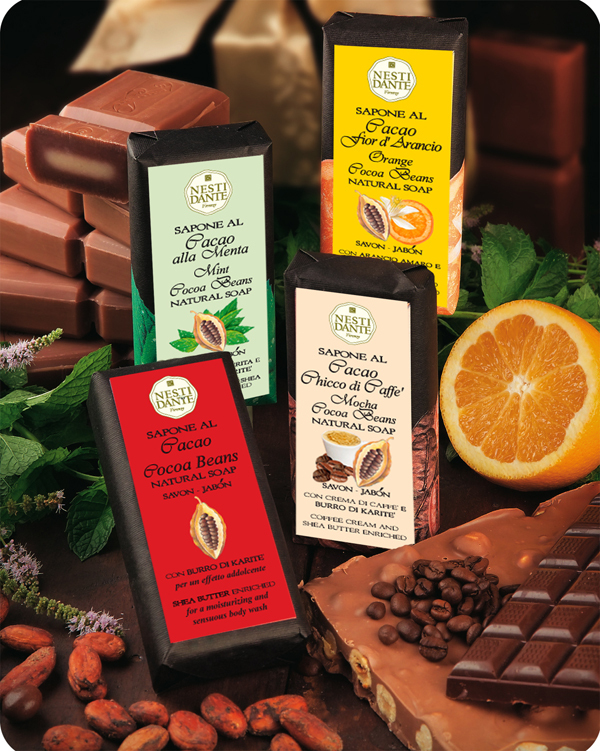 When it is Cioccolata by Nesti, the new line created by the Florence-based soapmakers! The scent of chocolate is undoubtedly one that evokes our carefree, childhood days and it also arouses sensations of both satisfaction and temptation. But as well as being a guilty pleasure which can stay on the hips, chocolate, according to recent scientific research, has therapeutic powers that help restore our energy levels and sense of well-being. These magical powers derive from cocoa, a key ingredient for the skin’s health. It is to rediscover this hidden pleasures that Nesti Dante has created Cioccolata by Nesti, based on cocoa beans, which stimulate the attention span and mental lucidity, improve the sense of well-being, help concentration levels and fight stress. Cocoa contains flavonoids, which are excellent anti-oxidants, and it offers pure and natural energy to the body and mind. The soap also contains shea butter which has well-known nourishing and dermo-active properties, as well as stimulating the anti-oxidant processes which are vital for the skin’s tone and tissues and, last but not least, help prevent damage caused by exposure to the sun. The soaps are like elegant and unique tablets of actual chocolate, in stylish paper wrappings. They immediately reveal an enticing fragrance, with the cocoa ingredient emerging to enhance the chocolate-like effect. The soap has been manufactured using processes from the finest traditions of Italian soapmaking. The soap paste is obtained from a long and complex process of boiling in a cauldron, which lasts for four days and requires the constant presence and meticulous intervention of master soap-makers and perfumers. This process does not alter in the slightest the formula’s top quality essences, rich oils and functional substances. In line with the artisanal tradition, the formulations do not contain any synthetic surfactants. Cioccolata by Nesti comes in four tempting versions: Dark Chocolate has the aroma of pure dark cocoa, irresistibly caressing the senses with a warm and enticingly sensual feeling (but don’t be carried away to taste it! ); Orange Chocolate, with the taste of paradise thanks to the combination of the sweet and warm orange fragrance with the dark notes of cocoa, leaving the body beautifully perfumed; Mocha Chocolate, with the rich aroma of coffee from your favourite café, plus the benefits of caffeine in naturally relieving swelling and minor imperfections caused by cellulite; and Mint Chocolate, evoking the best of after-dinner mints where the highly sensual aroma of dark cocoa is refreshed by a hint of stimulating fresh mint. The effects of using Cioccolata by Nesti may be surprising....someone may want to nibble away at your neck!